International tour leader, Wildlife artist, Abstract artist, wildlife cameraman, TV presenter, broadcaster and naturalist, Diarmid (Dee) Doody was born and brought up amongst the wildlife of South Africa where he developed his passion for nature and the big cats. He came to Britain from Southern Africa at the age of eight and raised his three children in mid Wales. In the 1980s he worked for the RSPB, and is one of the foremost experts on the Red Kite. He has worked hard for over 25 years to protect this magnificent bird and helped, along with others, to bring it back from the brink of extinction to its current status in Wales. He also raised and released the very first Kites back into the Highlands of Scotland in 1989. Diarmid has painted wildlife images for some twenty years and has concentrated primarily on the subjects closest to his heart. The big cats are without question his favourite subject, but Diarmid paints wildlife from polar bears in the Arctic to elephants on the plains of Africa. 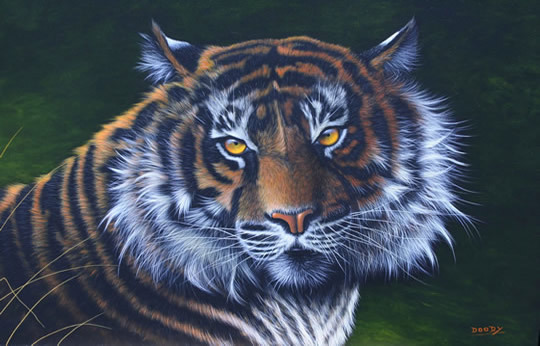 Diarmid's works are very detailed and are painted in either watercolour on pure rag paper, or oils or acrylics for the larger images, such as Tigers. As well as painting to commission, he has over the years found time to be the presenter of twenty four natural history documentaries and is also a respected wildlife cameraman. He was asked recently to introduce ITV's major wildlife series ‘Extinct’ for Wales, with Trevor MacDonald and David Suchet. In winter Diarmid produces his works from home, but in Summer he travels to countries such as St Lucia, Iceland, the Azores, Turkey, Cuba and many other locations leading tours and seeing countries, seeing their wildlife and gaining inspiration for his works. 4 weeks in the Azores enjoying whale watching. 4 weeks in St Lucia wildlife watching. 2 weeks in St Lucia wildlife watching. 6 weeks sailing between Rhodes, Simi and Leros. 10 days visiting Florence, Lucca and Piza. 2 weeks sailing around Iceland plus visiting interior for wildlife. 2 weeks in New England travelling into the mountains for the autumn colours. 2 weeks travelling around Cuba. Great inspiration. 2 weeks walking in the Pyrenees. 2 weeks in the Azores enjoying whale watching. November 2010 - Diarmid has an exhibition starting on November 15th. at the MOMA Wales gallery in Machynlleth. 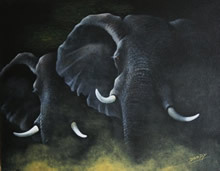 Spring /Summer 2010 - Diarmid will be painting in front of the public at The Aspinall Foundation Zoo, Port Lymptne and at Gigrin Farm Red kite feeding centre in mid Wales. Diarmid is also working on 9 paintings for exhibition in the Tabernacle Gallery in Machynlleth in November. Autumn /Winter 2009 - As the days close in, Diarmid plans to be working from home on various commissions and pieces for a one-man exhibition, as well as works recently commissioned by fine art galleries in Wales and the Borders.